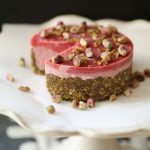 These delicious strawberry cheesecakes require no cooking and are perfect for easy entertaining! Prep takes less than 10 minutes, then just pop them in the freezer to set! 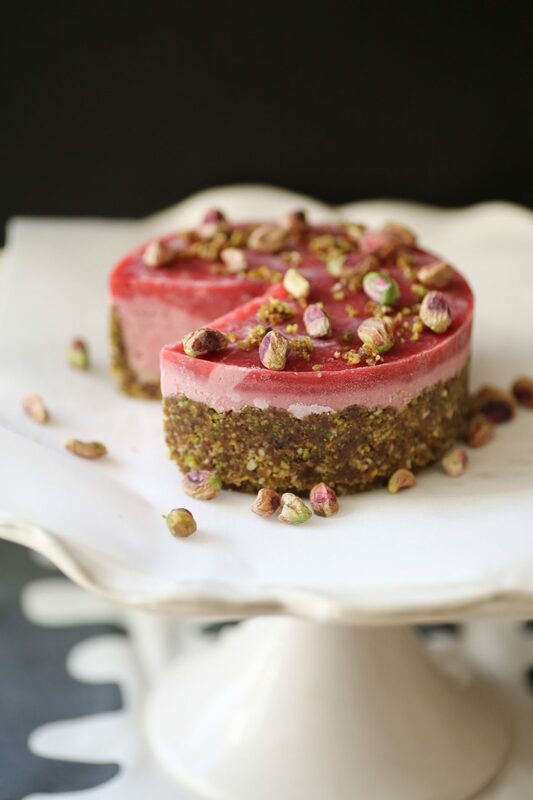 The addition of a pistachio and cashew based crust adds an incredible depth of flavour and beautiful colour to these mini cheesecakes that you will be proud to serve next time you entertain! Mix all crust ingredients together in a food processor so that it starts to stick together but some texture still remains. On a parchment paper lined cookie sheet, distribute the dough among six round cookie cutters and press down firmly to form a crust. Process all filling ingredients together in a food processor until smooth. Pour filling into cookie cutters on top of crusts and place cheesecakes into your freezer to set for at least 2 hours. Remove cheesecakes from freezer and let sit on counter for 5 minutes before serving. If desired, top with homemade strawberry puree.